We think we know Jesus - how he lived, how he taught, how he died and how he rose again - but does the way we live show others that we are following closely in his footsteps? Have we become so familiar with the story that we have forgotten the challenge at the heart of the message? In this innovative series of short teaching films, church leader and gifted communicator Andy Frost asks us to take a second look at the real Jesus: the hero, the wrestler, the wildman, the revolutionary, the dreamer, the underdog and finally, the headliner. How well do we know him? How closely do we follow him? How boldly do we take on our mission? 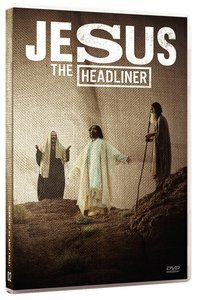 In Jesus the Headliner we are called to be followers of Jesus but that can be difficult. The footprints of the physical Jesus have long since disappeared and instead we often follow a set of rules or spiritual to-do lists. It is time to get back to following Jesus again and to do this we must first grapple to understand the very identity of Jesus. Running Time: Approx 15 minutes - includes study questions. Andy Frost is a surf-obsessed, movie-loving, Bible-reading, globe-trotting Londoner. He is the Director of Share Jesus International and is passionate about seeing how the Church can reconnect with society and culture. Andy has graduated from Billy Grahams Young English Evangelist Institute and has also completed his YWAM Discipleship Training School. He is presently studying for his MA in Applied Theology.